Anahita is presently in Corsica and would love to accommodate your clients for September and October in the Western Med. 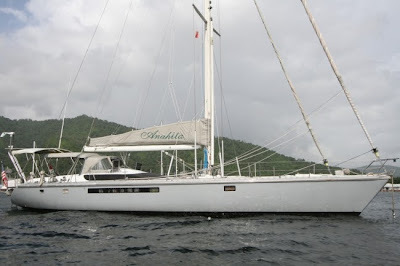 Anahita accommodates 6 guests in 3 cabins. Forward cabin has queen bed, ensuite manual head, sink and shower. Port cabin has upper/lower singles and ensuite manual head, sink and shower. Upper berth is removable. Fully air conditioned, inquire for night use. Fabulous ‘can do’ Captain/Chef! Wonderful rate: $12,500./week plus all expenses. Anahita is a beautiful Dynamique 62 designed by Phillipe Briand to combine luxury and comfort whilst still capable of high speed cruising. The uncluttered teak sun decks and the aft raised bathing platform with fresh water shower give plenty of space for relaxing in the sun. If you wish to be more active, the boat is equipped with snorkeling and fishing equipment, windsurfer and water-skis. The wide open cockpit provides shade under the bimini for you to enjoy cold drinks, lunch or dinner "al fresco" with the cooling sea breeze in your hair. Below decks the yacht is quite spacious. The airy salon is furnished with a large dining table that seats up to eight. A cocktail area, a 30 – inch high definition TV, and the hi-fi equipment are all close at hand. The yacht is fully air-conditioned. The cabins are roomy and enjoy the privacy of an ensuite head and shower. All cabins have ample storage space including hanging lockers and cabinets. Forward cabin has double bed, satie, separate manual head, sink and shower. - Starboard cabin has queen bed ensuite manual head, sink and shower. - Port cabin has up and down single beds and ensuite manual head, sink and shower. Upper berth is removable. - Full Air conditioning, inquire for all night use.